Dubbed "Carousel," the rock in this image was the target of the Mars Exploration Rover Opportunity science team's outcrop "scuff test." The image on the left, taken by the rover's navigation camera on sol 48 of the mission (March 12, 2004), shows the rock pre-scuff. 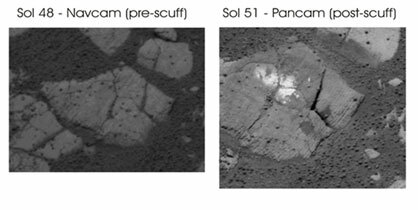 On sol 51 (March 15, 2004), Opportunity slowly rotated its left front wheel on the rock, abrading it in the same way that geology students use a scratch test to determine the hardness of minerals. The image on the right, taken by the rover's navigation camera on sol 51, shows the rock post-scuff. In this image, it is apparent that Opportunity scratched the surface of "Carousel" and deposited dirt that it was carrying in its wheel rims.